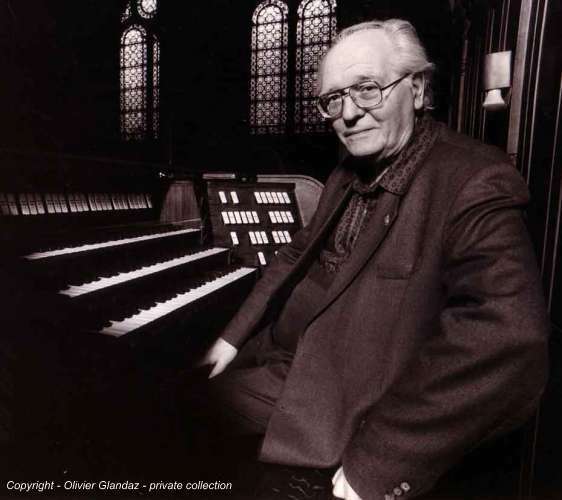 “Olivier Messiaen; December 10, 1908 – April 27, 1992) was a French composer, organist and ornithologist, widely regarded as one of the major composers of the 20th century. His music is rhythmically complex (he was interested in rhythms from ancient Greek and from Hindu sources); harmonically and melodically it is based on modes of limited transposition, which he abstracted from his early compositions and improvisations. Many of his compositions depict what he termed "the marvellous aspects of the faith", and drew on his deeply held Roman Catholicism. He said he perceived colours when he heard certain musical chords, particularly those built from his modes (a phenomenon known as synaesthesia); combinations of these colours, he said, were important in his compositional process. I really encourage you to read this article and Tikker is of curse right. There are some serious flaws in the recordings. The organ is some places hopelessly out of tune and the fidelity of the sound taken in account recordings took place in 1956 is simply too Low Fi. One story goes, that when Messiaen was asked whether he wanted the organ tuned for the recordings, he replied, “Why, no? It’s only been 15 years since it was tuned the last time”. Messiaen's performances differ quite a lot from modern performances. They are very pragmatic in the terms of tempo, rhythms and even registrations (even though he plays the works at the exact instrument for which they were composed!). 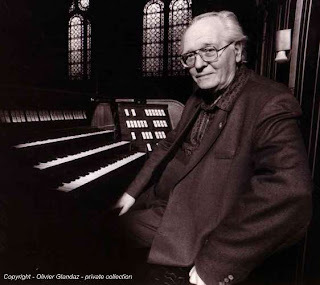 Some critics say that Messiaen wasn’t really an organist and therefore his rendering of his organ music cannot be trusted as his original intentions. Some critics say that they lack on the technical side simply that Messiaen wasn’t technically up for the job playing his organ music. I think both arguments are quite simply wrong. It’s clear that Messiaen plays his works with brilliance, deep understanding, and he is all the way through technically in total command. When he chooses to go alternative ways compared to the text, it’s because he want’s to do it that way. I don’t like to hail any recording as the definitive recording, but these recordings are a fascinating view into the musicianship and aesthetic of Olivier Messiaen. Some technical details - It’s clear that the music was recorded on magnetic tape; there are some rough cuts here and there, cuts which only were possible with magnetic tape. The sound quality is, as mentioned, very poor compared to other organ recordings produced in the mid 1950s. Lastly but not least perhaps the only thing not entirely up for the job was perhaps the organ, which sounds like it’s in much disrepair. These three things taken into account and the fact that if Olivier Messiaen, as the towering personality he was, also among his contemporaries, had wanted it otherwise, he could most definitely had had it, show him as a very free and pragmatic musician. It’s perhaps a view musicians could incorporate more into the interpretations of his music today? Thanks to Anders Riber for the transfers of the originals LPs. I’ll be posting the other recordings from 1956 and they are transferred, so stay tuned. The "Apparition" file is missing from the archive!